Enugu State University of Science and Technology (ESUT) Peace, Conflict and Development Studies Masters Degree and Doctor of Philosophy Postgraduate Admission Form for 2018/2019 Academic Session. 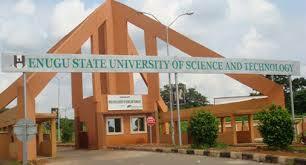 Eligible candidates are to apply online by visiting ESUT website: www.esut.edu.ng and click on Post-Graduate Admission. Follow the same procedure as applicable to other ESUT PG programmes.